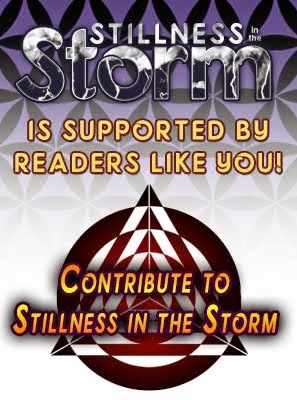 (Stillness in the Storm Editor) To most of those aware of the insidious nature of various conspiratorial groups—with such names as the Deep State, the Cabal and the Illuminati—the use of intelligence services is a standard practice. And for most of human history, when a despotic elite needed to maintain control over a population or manipulate events to suit a clandestine agenda, spies, secrecy, and espionage were employed. One former intelligence officer is pulling back the curtain, revealing that as domineering as some of these groups are, like the NSA, CIA or DHS, they are also compartmentalized almost to the point of being ineffective. 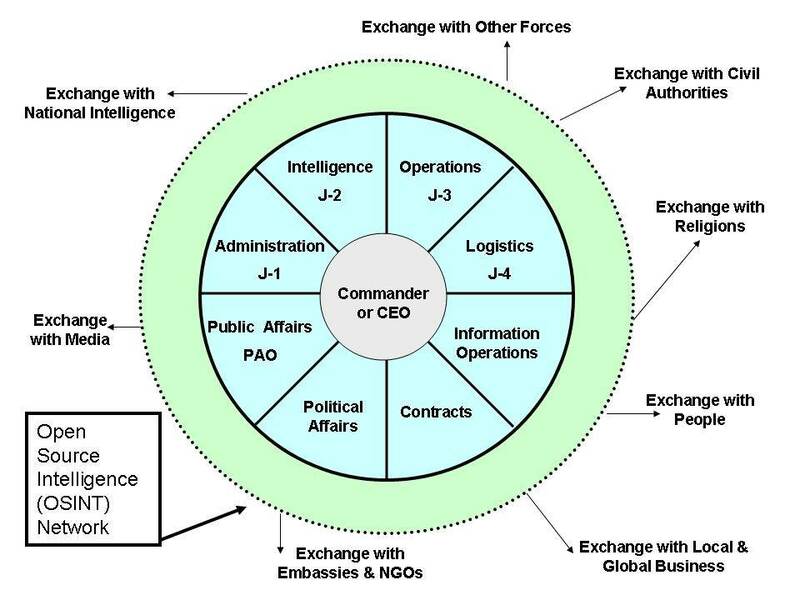 Of course, this is arguably by design, as these same organizes help manage the shadow government. But what if the system could be re-purposed, made less costly, and actually in service of the people? Robert David Steele is a former CIA officer turned activist who has arguably revealed what has remained hidden for a very long time: the purpose of intelligence services. 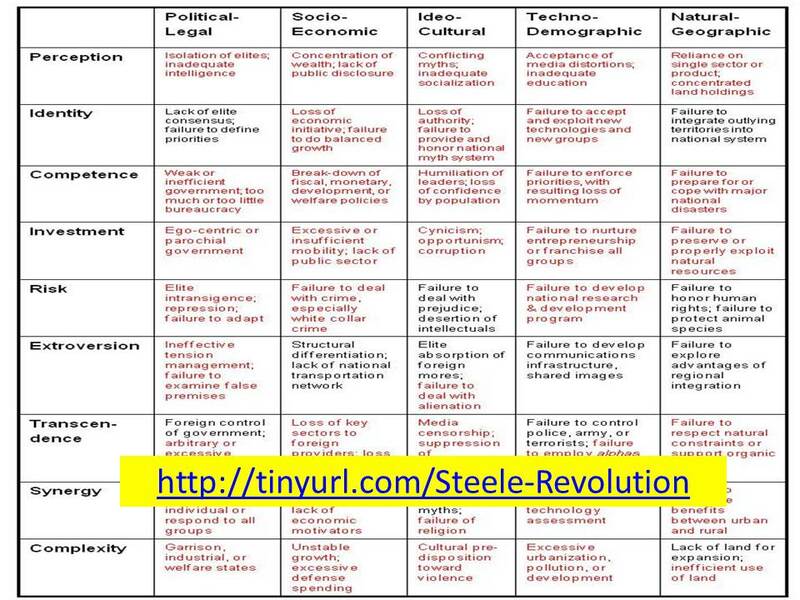 The following presentation by Steele gives us a glimpse into how intelligence agencies work. Today, intelligence services have essentially become mercenary forces for various power players on the world stage. Almost every organization of prominence has an intelligence service or uses them to their advantage, including: the Vatican, every nation on the U.N. Security Council, and most large-scale corporations. Why? 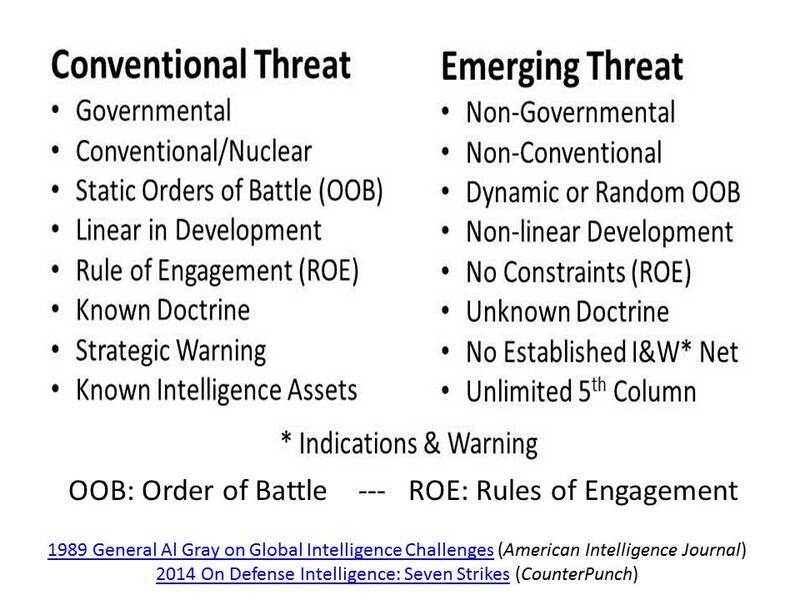 Steele says that intelligence services exist for what is called Decision Support. Simply put, making the right decision is very important, whether it is an individual, family, small business, or major organizations like a government. And obviously, the more accurate information one has to make decisions, the better the outcome will be. Intelligence services gather information, usually in vast quantities, analyze it so as to produce reports that focus on a specific aspect, and then send these reports to those with decision-making power. Now the glaring problem that almost everyone agrees on is that the agendas that these organizations are working towards are not only hidden from public scrutiny, but are downright dishonorable and harmful for the people. For example, the CIA plays a major role in drug trafficking, and has done so for decades. 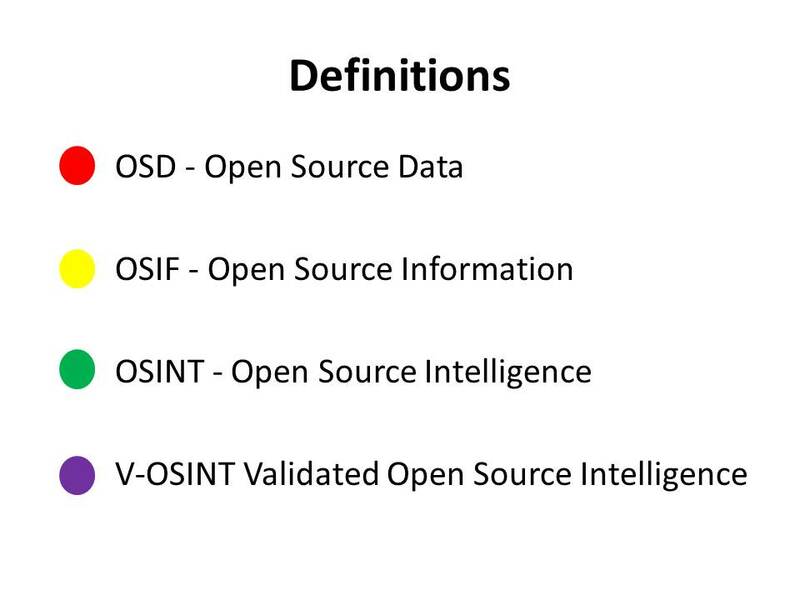 How does open-source intelligence (OSINT) help? 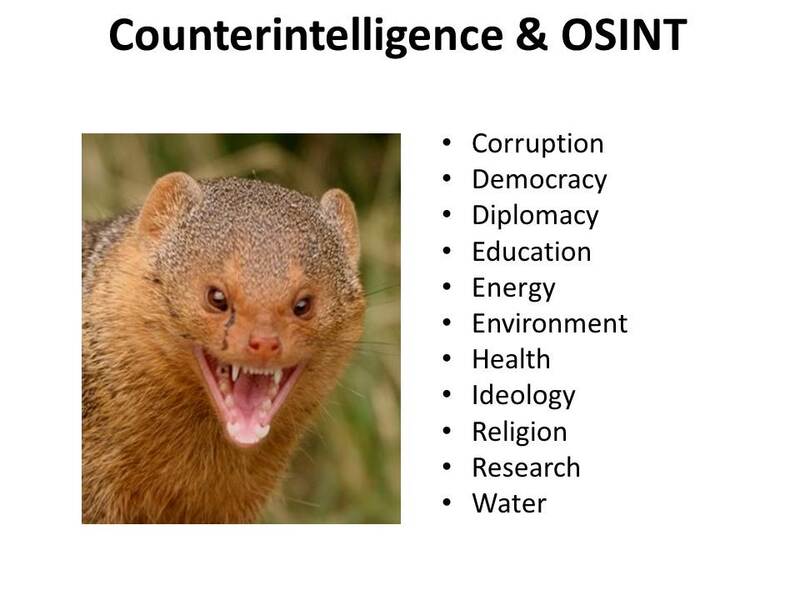 The following presentation by Steele discusses what OSINT can do, directed towards those in power. But I am going to take it a step further by suggesting that an open source intelligence system should be for everyone, focused on providing vital information to all people in a free and open-source way. This way everyone can have access to information they need to make wise decisions in life, whether something small like choosing an internet service provider, or something large, like forming a coalition to gain legal protections from a parasitic government. The fact is the powers that should not be are extremely well organized, focused, and cooperative, much more than most people realize. Those seeking freedom, truth, and prosperity need to be just as organized. The war for freedom is just that—a war. There are people who have a vested interest in keeping most of the planet ignorant, traumatized, and enslaved. And for the most part, the freedom movement is a disorganized rabble that has been rendered almost completely ineffective—primarily because we can't seem to work together. We're all laboring under decades of social programming meant to keep us divided. Thus, the solution is to form a cohesive network for gathering and compiling information. 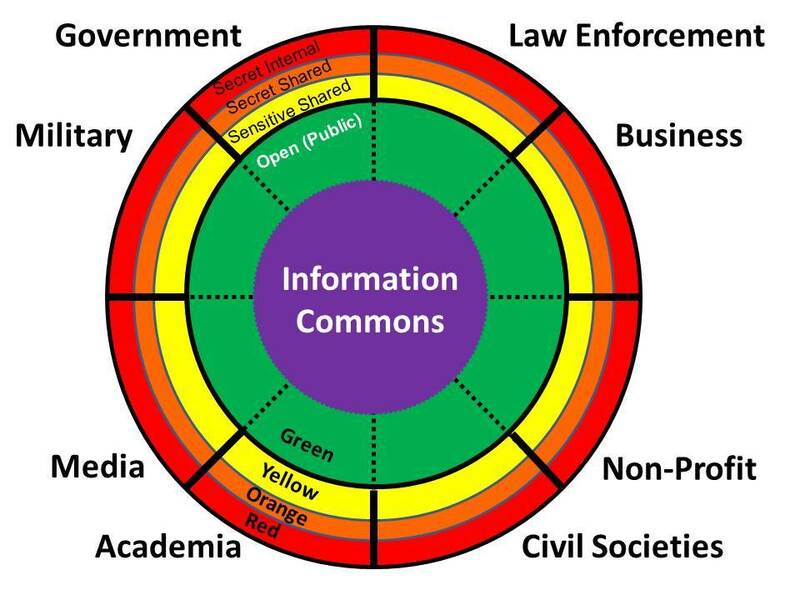 There is a wealth of information currently available in an open-source way—millions of people use the internet to do research, compile their findings and present them to the world. Furthermore, each individual is a data-gathering node in their own right, absorbing and analyzing information for their own personal use. What if there was a system that enhanced this process whereby information quality and access was bolstered at every level? Imagine if even half of the truth movement was supported by having a data base of information that is analyzed, verified, and disseminated to support all the essential projects, programs, and efforts of those seeking freedom for all? What if we had a think tank where we could clearly and concisely establish consensus so as to form systems of material, emotional, and intellectual support? 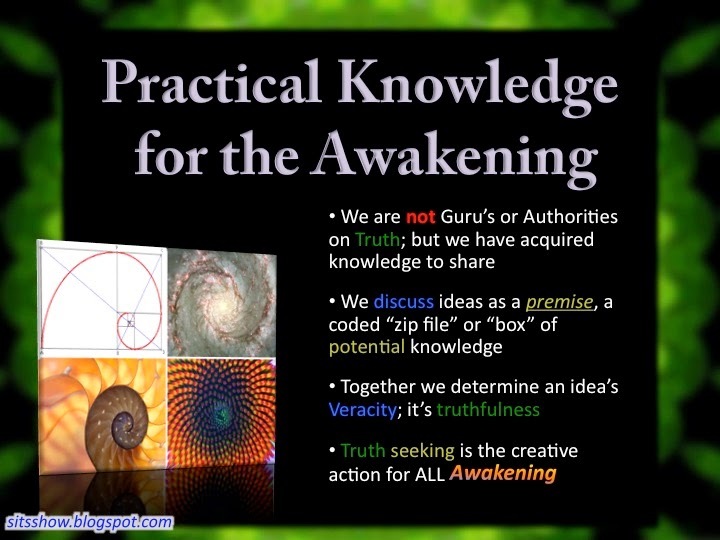 What if every truth seeker on earth was connected and working together to support each other, developing campaigns to end GMOs, stop chemical spraying (chemtrails), support each other legally against the Deep State, and so on? In my view, without this network of connection and a venue to finally heal the divisions within the human family, our efforts to bring about change will likely be ineffective. At present, there are dozens if not hundreds of groups—most of which are working on the same projects—competing with each other instead of working together. This can't and won't work. There are some tasks that we just can't blindly push through with gusto and enthusiasm alone. There are some things that take precision, critical thinking, hard work, and most importantly, cooperation, to get accomplished—and the task of ending slavery, restoring the human family and the planet is arguably the greatest effort ever conceived. Do we really think we can do it without cooperation, as islands of freedom in a sea of ignorant slaves? I think that in the age of information, with somewhat easy access to the internet, we have an incredible opportunity to truly unite and make this world a better place. The concept of open-source intelligence can help us with that goal because intelligence gathering is an age old enterprise for coordinating large scale endeavors—not just for totalitarian governments that have lost their way. 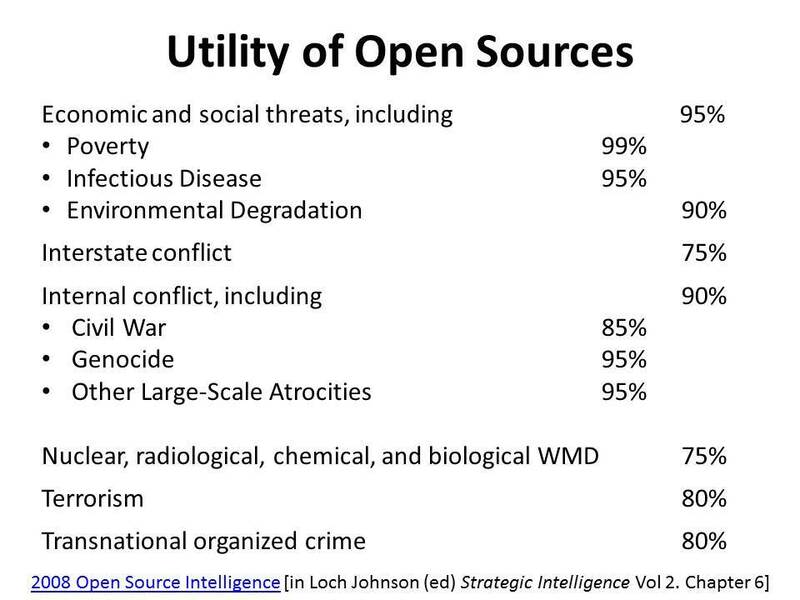 As a supplement to the following presentation, see his book The Open-Source Everything Manifesto: Transparency, Truth, and Trust (Manifesto Series) . Robert David Steele, the founder of the modern Open Source Intelligence (OSINT) movement who is also the foremost proponent for Open Source Everything Engineering (OSEE) and the creation of a national Open Source (Technologies) Agency, is now available via direct hire or via multiple contract vehicles in the US (including GSA and INSCOM) to do NOCONTRACT Non-Publicity reviews of existing OSINT programs or help design new and expanded OSINT programs inclusive of shared access to the new non-profit multinational network, ZULU GRUB. Contractors desiring to protect their option years from cancellation can be assisted toward full competency across all aspects of both Passive and Active as well as Black OSINT. Passive OSINT is operating at perhaps 30% of its potential, failing to leverage all of the sources and tools that are available if one knows how to find them. Active OSINT has been completely trashed — even direct surveys of indigenous foreign personnel, when done, are corrupt and misleading. An opportunity now exists for both the US Government — and particularly all those including Special Operations Forces who see that they are either receiving nothing from secret intelligence or 4% “at best” of their needs & feeds from secret intelligence — to reinvent intelligence. 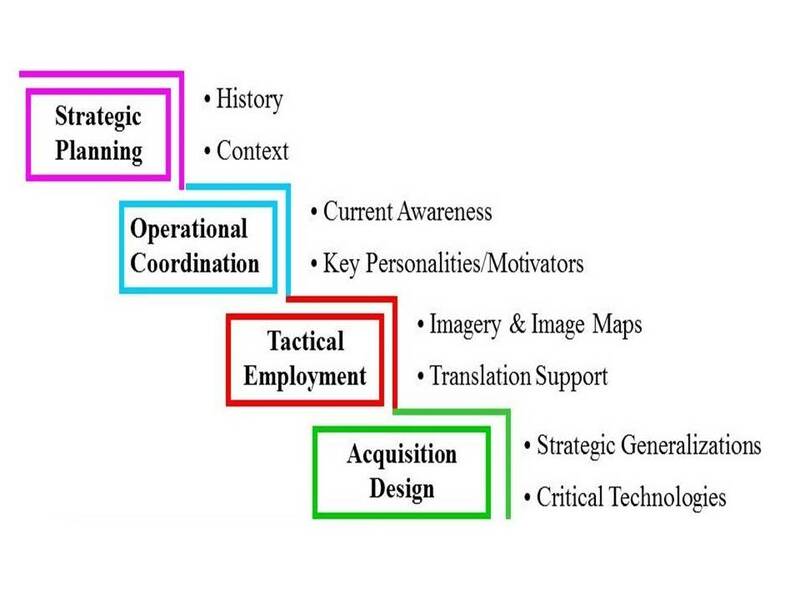 OSINT Done Right can radically enhance strategy, policy, operations, and acquisition, while radically lowering the costs of enhanced mission accomplishment. Black OSINT is simply incompetent. Neither the government nor the contractors have any idea how to execute untraceable cyber-operations. US Army “white” computers scream out their CONUS origins and every existing contractor has made at least three fundamental mistakes that easily reveal their true names and purpose. 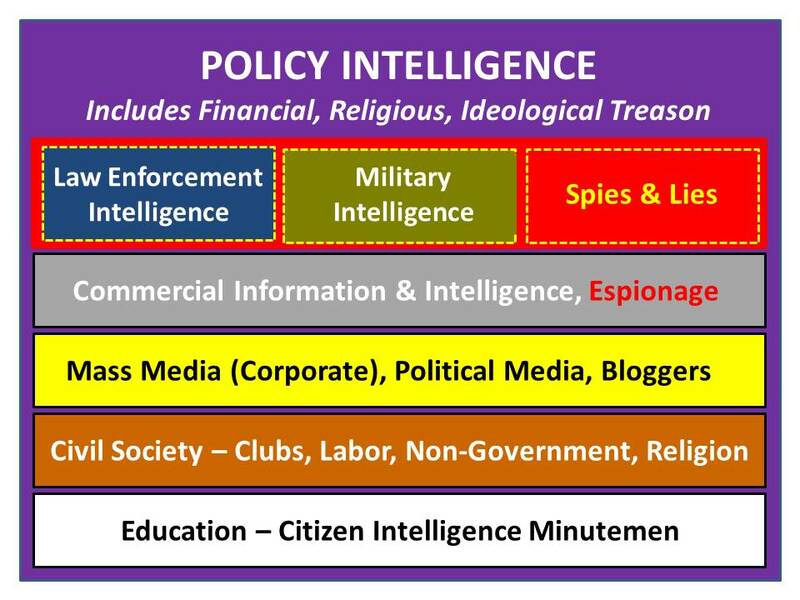 As a sideline, organizations with strategic, operational, tactical, and technical requirements for all source intelligence can be taught how to quickly establish their own collection requirements and evaluations staff that documents the failure of the secret intelligence community to meet their needs from week to week. Within 90 days, this will lead to a Congressional awareness of the need to shift money from secret sources controlled by others to open sources controlled by the consumer. The new conference planned for December 2017 has many of the speakers already confirmed, and an appreciation for all that is not being done can be gained by reviewing that website, ose-21.org. Nominations for awards (some are doing brilliant work in isolation), exhibits, and speakers are still open. Contributions to the new OSINT Handbook and the new OSINT Tool-Kit (free integrated open source on a flashdrive, TOOZL 4.0) are invited. Individual speakers shown at the website — and many other top minds not now consulted by the intelligence producers and consumers (many of the latter not receiving any form of intelligence or decision-support) are individually available to assist those willing to learn, in advance of the event, via video-teleconference or through on site training and hands-on demonstrations. Robert is based in Oakton VA. His primary web site, http://robertdavidsteele.com, includes a Contact page. The below briefing has been funded, approved and was deliveredin its present form, in April 2016, to the military, police, and national intelligence services of Denmark. Both were also presented in Norway, but less formally. 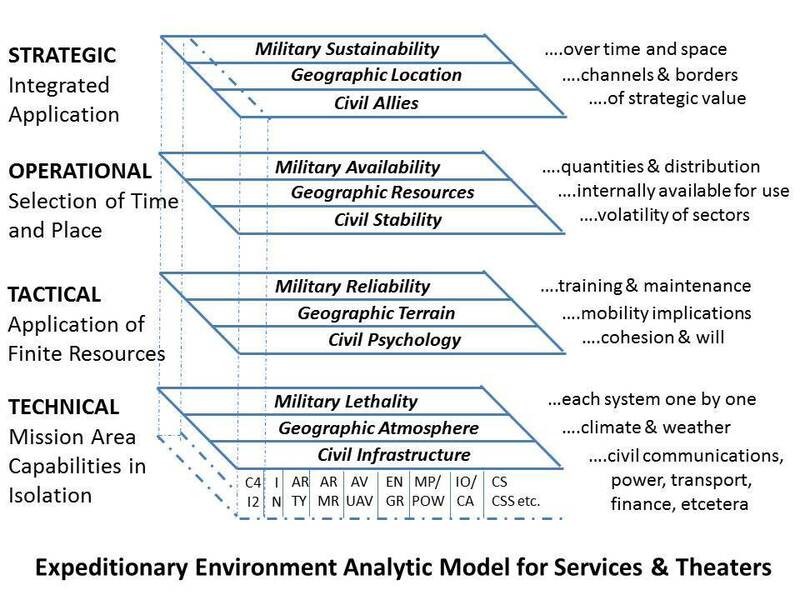 As NATO and a number of countries “re-think” Open Source Intelligence (OSINT), this briefing and the related white paper linked below, should help focus on the essentials that have been neglected for the past quarter century. Even today, I think this is still a problem in most ‘modern’ intelligence staffs. People think that simply collecting open source info – although now from a wider range of sources – is OSINT, when I say it is not. It’s like collecting satellite pictures and calling them IMINT … the job isn’t done until they are analyzed and an assessment made. If I was king of the world, I would build an OSINT organization to rival existing national SIGINT organizations (CSEC in Canada, NSA in US) and HUMINT organizations (CSIS in Canada, CIA in US). This OSINT organization would be in a number of big buildings around the country, tapped into all the sources you have long written about (media, experts, academia … all tribes) AND they would produce magnificent ‘single source’ OSINT products that could be added to SIGINT, HUMINT, IMINT etc. products at the national level. 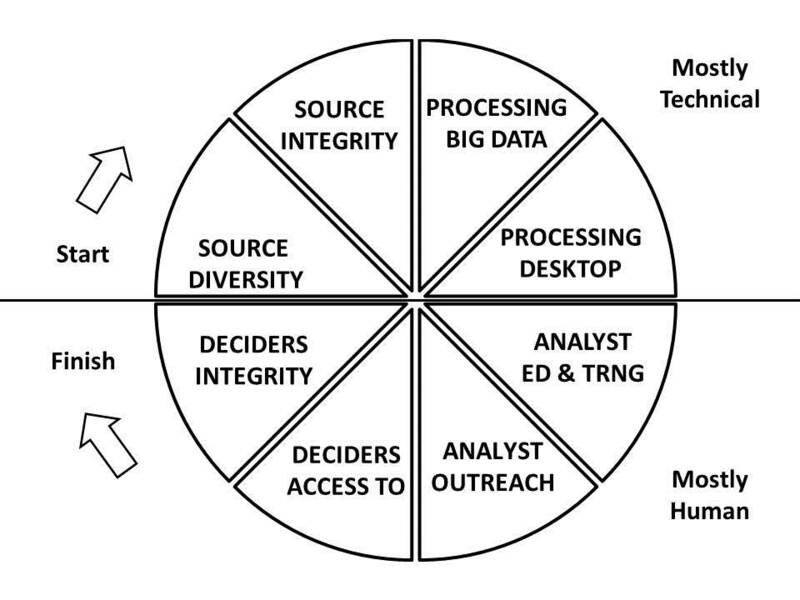 Given the power and range of today’s global communications, I suspect OSINT products would be more complete and powerful than any other single source product. I have prepared 40 slides to deliver in 40 minutes, leaving 20 minutes for questions now, and then we can discuss details in the working groups and if desired later via email or skype. You will not have time to read every word – I am delivering impressions from 25 years of work as the primary pioneer in this field, you can study the briefing in detail later, my planned words are in Notes format at the tiny url shown here – 2016-OSINT. This is the plan for the brief. I will be showing some complex graphics you can return to later on your own. For today the key points are these. Alvin Toffler helped me create this slide. We were returning from a lunch with US defense intelligence leaders when he turned to me and said “they don’t want to leave their little green box.” I instantly visualized this. 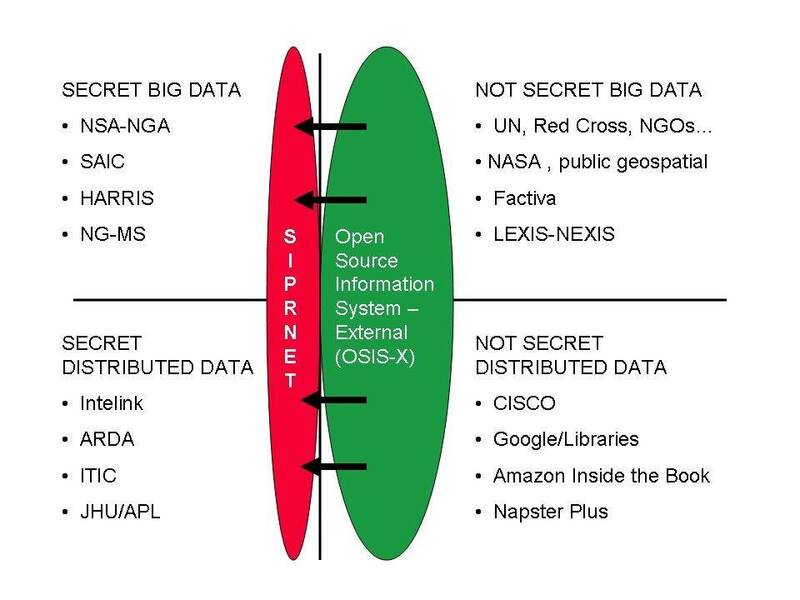 Two points: OSINT is about harvesting ALL of this information outside the green box. And second, at the policy level, it is vital that we understand competing interests. My first book was entitled ON INTELLIGENCE: Spies and Secrecy in an Open World. My core concern today is that the US has corrupted NATO intelligence by over-emphasizing secret technical collection that is not processed, and neglecting everything else. 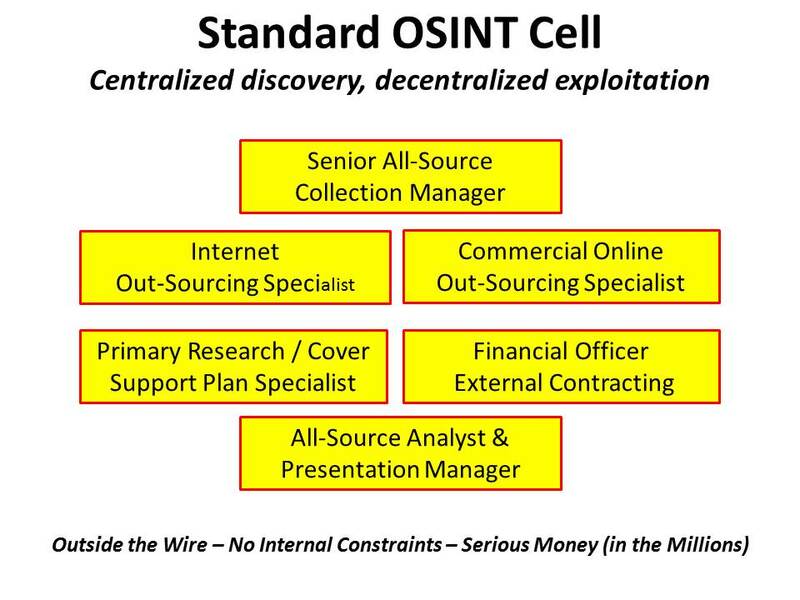 There are major centralized and distributed repositories of OSINT that we should not ignore. 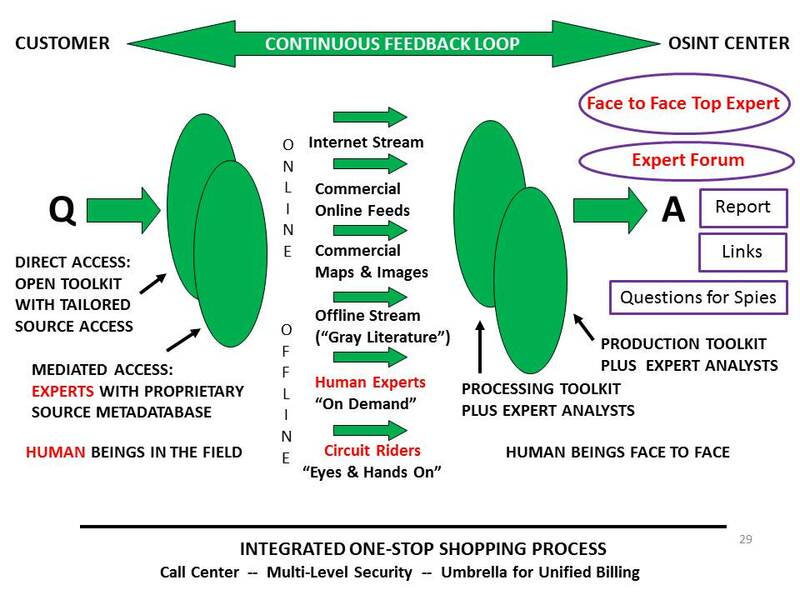 LtCol Gary Beaver, USA gave me this concept, this is how he used OSINT in Bosnia, as a buffer zone to enable information sharing operations with external elements. As war has grown more complex, intelligence has failed to adapt. I’ll give you a moment to look at this graphic. 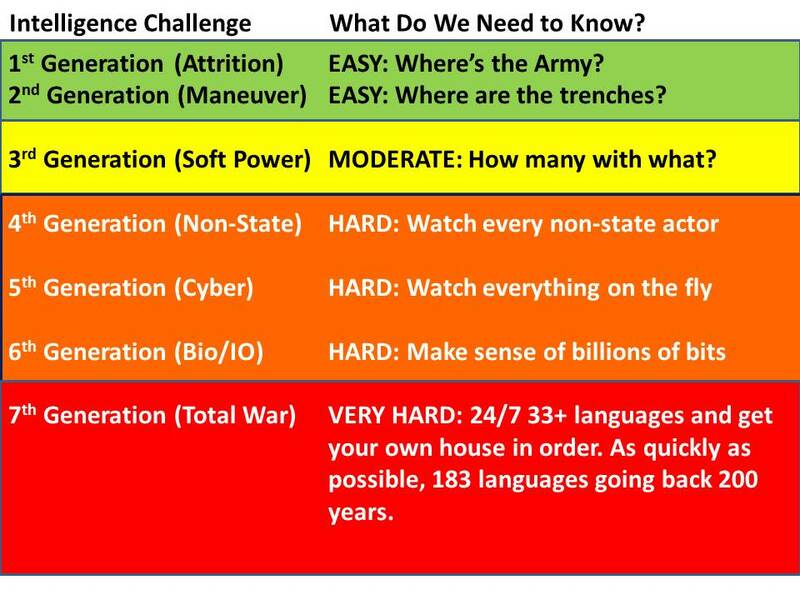 The harsh reality is that OSINT is the only source able to answer 80% or more of our commanders needs as well as acquisition, policy, and strategy needs. This is my latest depiction of where we are in relation to where we need to be. We are not serious about understanding and defeating all ten high level threats to humanity, and we are not serious about creating deep OSINT, multinational multilingual information sharing and sense-making, or my ultimate desire, the world brain and global game – that connects all minds to all information all the time. In 1988 the Marine Corps pulled me out of the CIA and made me the senior civilian responsible for creating the Marine Corps Intelligence Center – our primary duty was acquisition intelligence. This is the model I created for studying the real world. The real world is hot and humid with bridge loading limits of 30 tons or less, limited line of sight distances, and poor cross-country mobility. I provide a link to the study on the last graphic. In 1989, based on my experience with the new model, I ghost wrote for the Commandant an article sounding the alarm on emerging threats and calling for third world appraisals needed to justify peaceful preventive measures such as would have prevented ISIS and the illegal immigrants. We were ignored. The American “way of war” is expensive, technical, and counter-productive. It has corrupted NATO. This is the heart of my 1976 graduate thesis that created a model for studying the preconditions of revolution. The conditions shown here in red exist in the USA today. I will not discuss this in detail, you can read the paper and study the graphic at the tiny URL shown here. 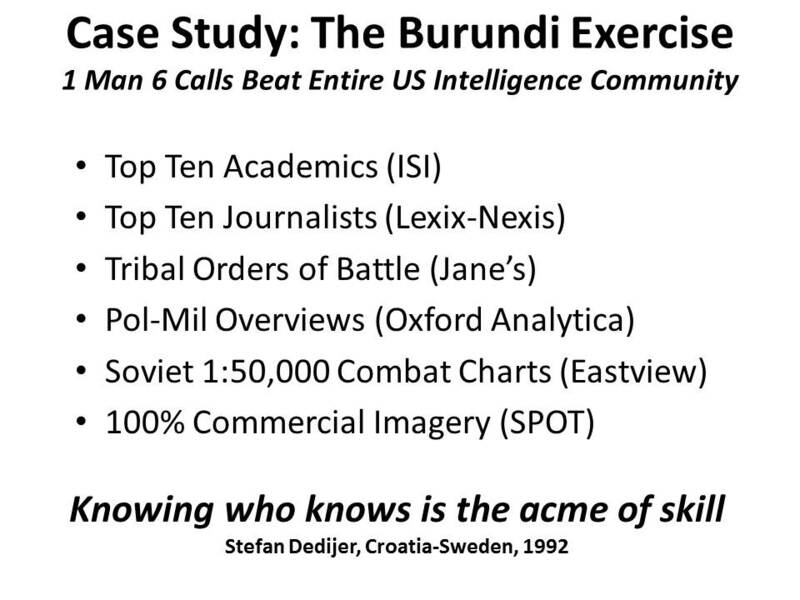 The core point is that secret intelligence is useless and OSINT is priceless, in this context. The Great Books of the Western World as published by the University of Chicago and Encyclopedia Britannica have a stunning two-volume Syntopicon with reference sections for each of 144 key cultural concepts. As a young lieutenant bored with garrison duty I created this chart one day, to show all 144 concepts in relation to one another. 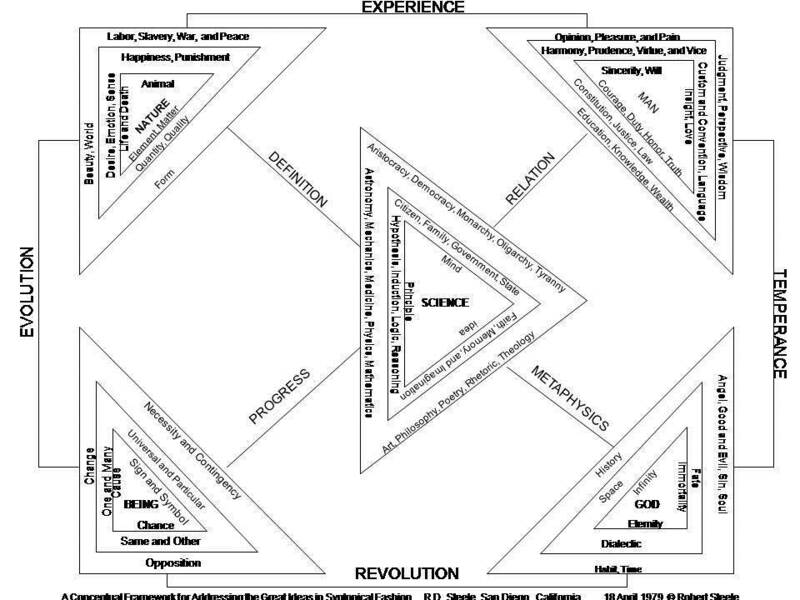 We cannot understand other cultures without understanding how they see each of these concepts. Another area where OSINT is fundamental is in relation to the new reality that war is less about state on state military power and more and more about distributed individuals each capable of shutting down entire power and communications and water networks. 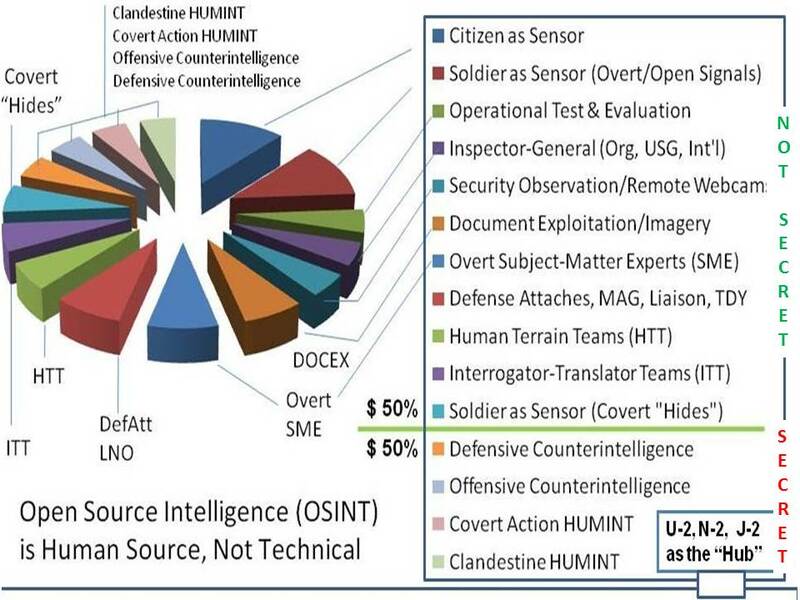 Ultimately OSINT is about turning every citizen into an intelligence minuteman, and being on guard, openly, all the time. 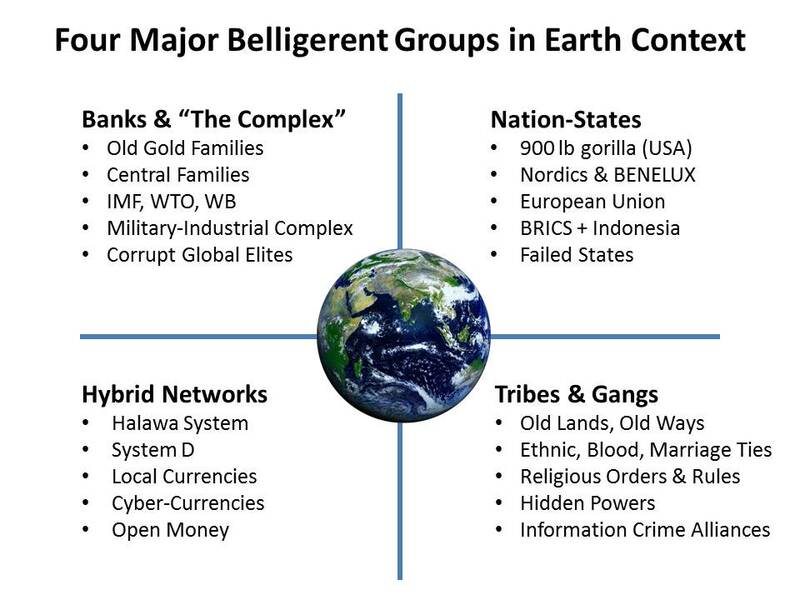 This depiction of the four major belligerent groups further emphasizes the vital nature of OSINT for state security. We have failed to be serious about creating orders of battle for non-state actors. We have failed to be serious about counterintelligence against non-state threats to the state and the society. Homeland defense is vastly more important today. I was the author of the letter to the White House in 1994 sounding the alarm on cyber-vulnerability, with three co-signers including the top NSA security engineer and Winn Schwartau. We were ignored. For the past 25 years we should have been fortifying all cyber-systems – instead we allowed NSA and US IT CEOs to handicap and sabotage cyber-security for their convenience. 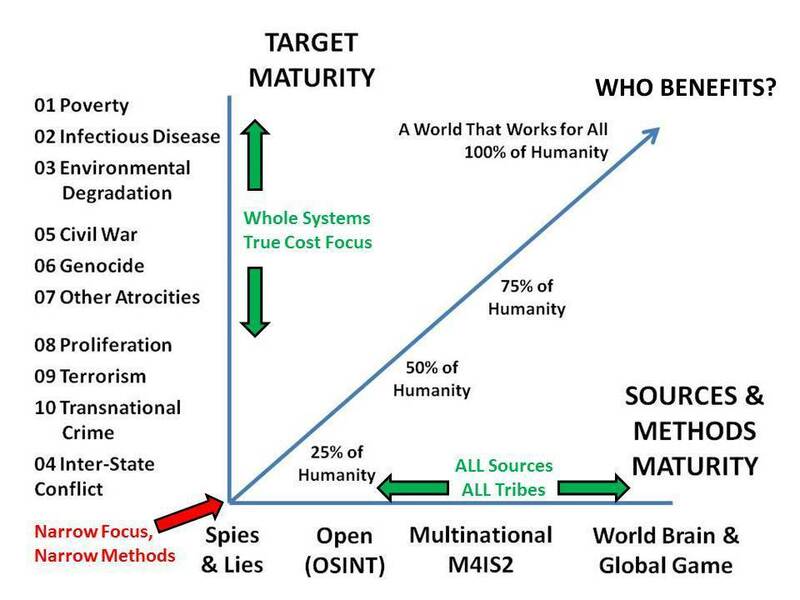 Here I offer my estimate of the utility of OSINT against each of the ten high level threats to humanity as identified by LtGen Brent Scowcroft, USAF (Ret) and other members of the UN High-Level Panel on Threats, Challenges, and Change, as it reported out in 2004 in a book entitled A More Secure World: Our Shared Responsibility. It is not possible to be a Smart Nation or a Safe Nation without a major investment in OSINT. Most OSINT is not OSINT. To qualify as intelligence or decision support it must answer a question from a specific person. I learned that to make peace with the CIA we had to distinguish between OSINT that any commercial provider can create, and Validated OSINT that only an all-source government analyst can bless, saying we concur, or at least, we do not have a basis for disagreeing. I modified this graphic from Stephen E. Arnold. 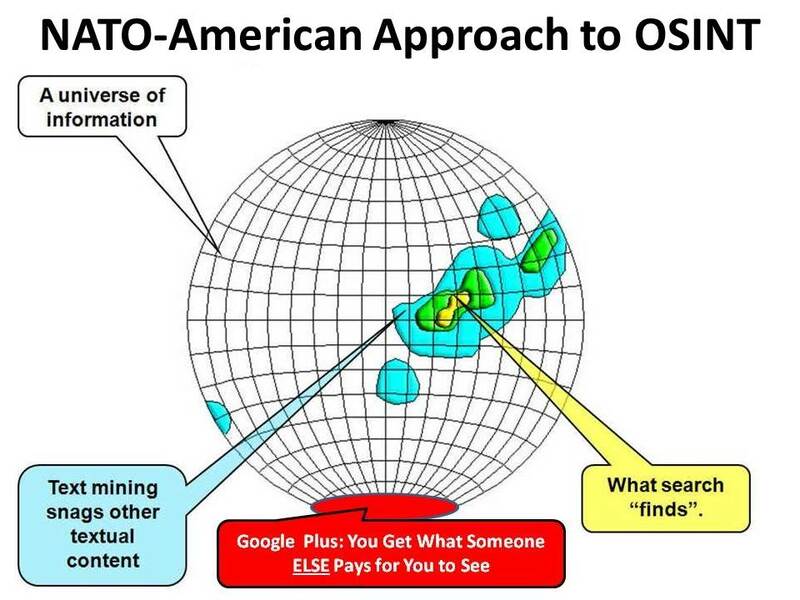 The fact is that the NATO-US approach to OSINT merely skims the surface, like the drunk looking for his keys under the light. Google indexes less than 4% of the web and nobody is indexing the analog information or the unpublished information. Worse, Google manipulates search results depending on who pays to be seen. Here is a deeper look at this challenge. Only 1% of WRITTEN scientific papers are PUBLISHED. It only gets worse when you consider foreign languages and whether researchers will perform due diligence. 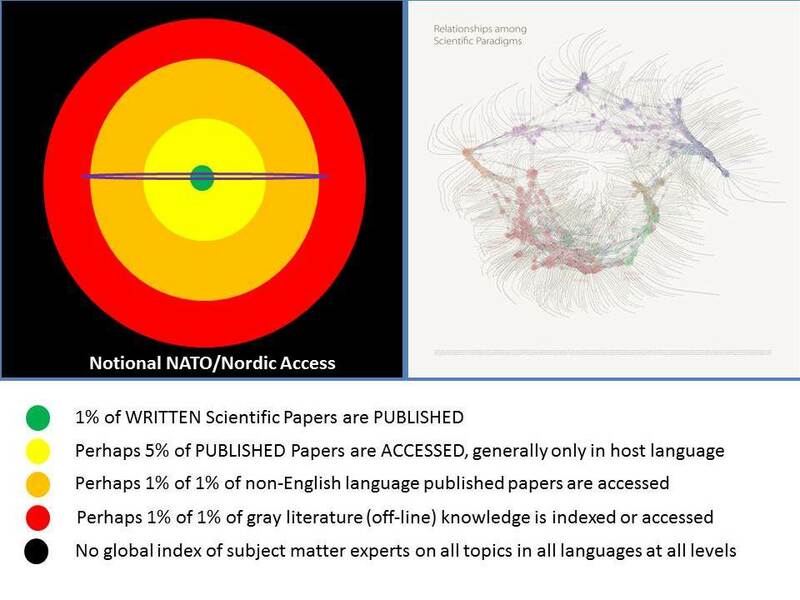 On the left is the fragmentation of the scientific community, an archipelago of isolated fiefdoms where a PhD can be earned knowing everything about nothing and nothing about everything. 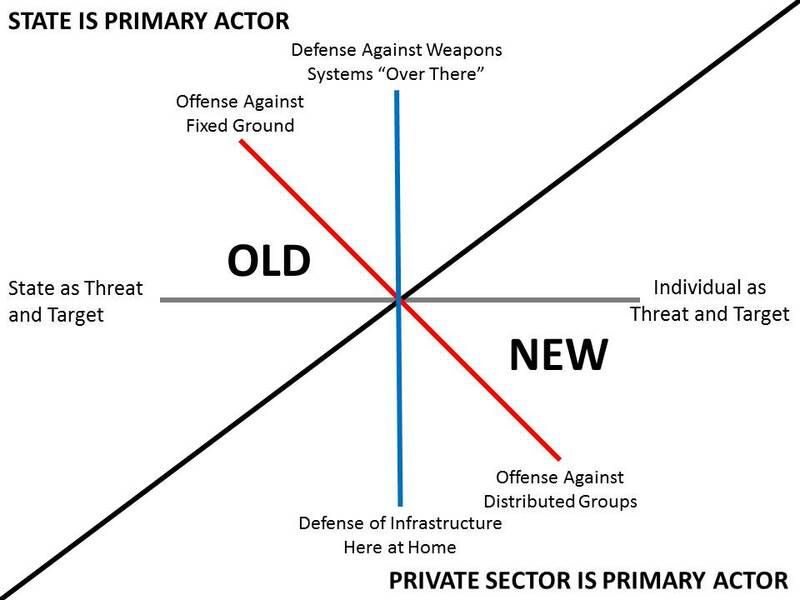 I was interviewed to be the senior defense leader for HUMINT, and this was my vision. I was not selected – they wanted someone who would focus only on stealing secrets. The fact is that HUMINT consists of at least fifteen slices, only four of which are secret. 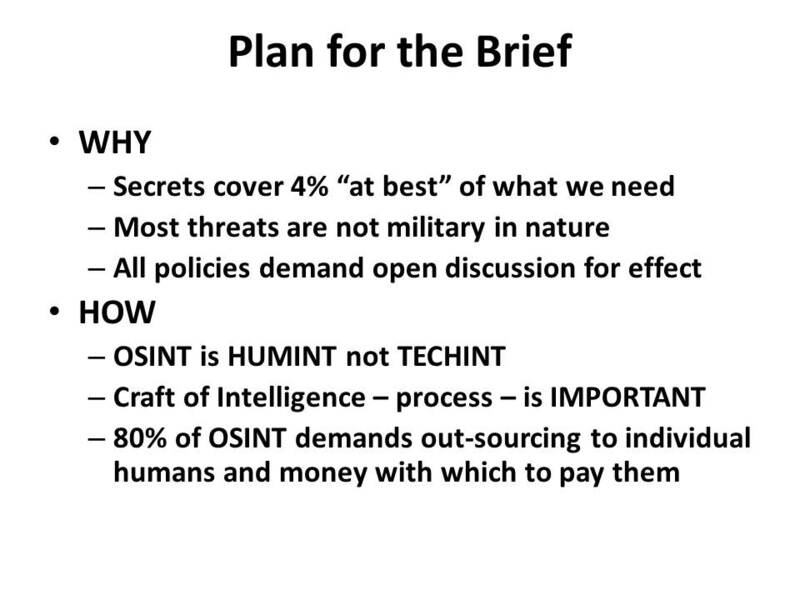 It is irresponsible to not manage all HUMINT together, and I would emphasize that OSINT is HUMINT, not TECHINT. My monograph is free online at http://tinyurl.com/Steele-HUMINT. Here is another way of looking at the centrality of OSINT in relation to both secret intelligence and counterintelligence, and the ultimate combat mission of sabotage behind enemy lines. 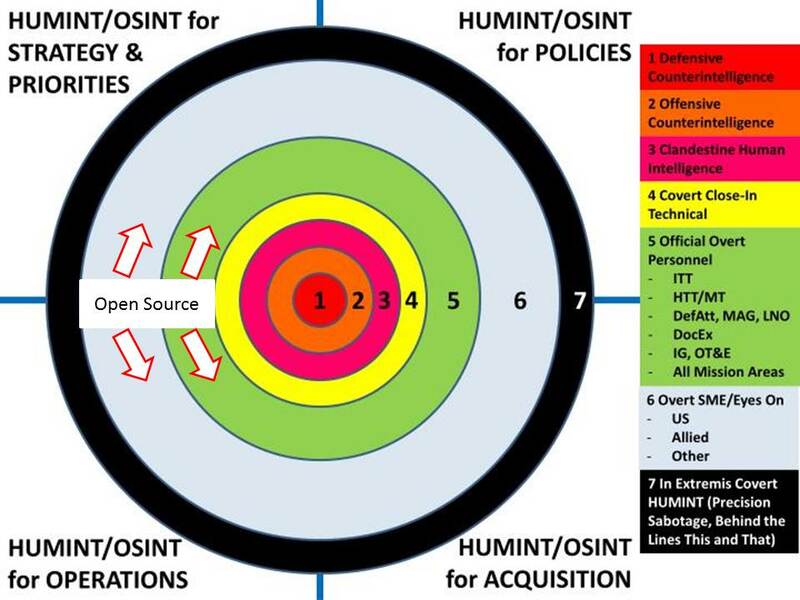 PAUSE Please note that OSINT (and all-source intelligence) should be organized to support strategy, policy, acquisition, and operations. I don’t know of anyone doing this correctly. You will recall the isolated boxes from the beginning of my remarks. 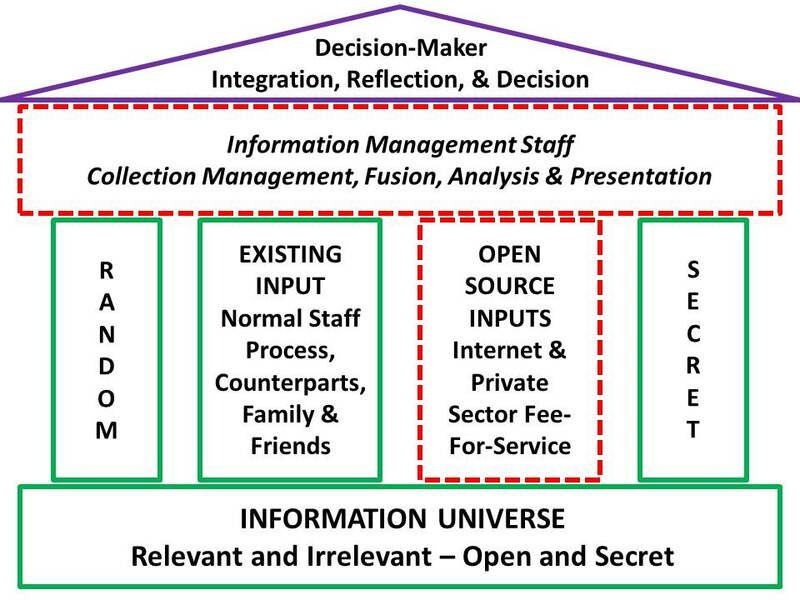 Here I show the eight tribes of information, emphasizing that government is the smallest and least informed tribe. We cannot do OSINT without harnessing what these other tribes can access – and most of them do not like us, do not trust us, and do not want to share. Academic: all academics, accessing all their knowledge both published and unpublished. This graphic was created by Jan Herring, the first National Intelligence Officer for Science & Technology in the US, in the 1970’s. We still do not do this. Note that OSINT can become secret. Note the ratios of need versus cost. We can discuss this further in our follow-on discussion. Six people can harvest the external world of knowledge if they know what they are doing and have the money with which to leverage intermediaries as well as reward individual human elements as needed. Collection Manager needs to have the confidence of the secret world and to hear their requirements in classified terms. Internet Out-Sourcing Specialist leverages thousands of different softwares and skill sets as needed. Commercial Online Out-Sourcing Specialist leverages hundreds of different database and language and subject matter search specialists. Primary Research/Cover Support Plan Specialists manages tens if not hundreds of channels for hiring people directly, one at a time subject matter experts, information brokers, private investigators, free lance journalists, and more. Financial Officer has the authority to spend $2,500 to $25,000 and with a validating signature from main finance, $250,000 amounts. Anything over that is pork and waste. All-Source Analyst and Presentation Manager: needs all classified access to understand the context (and limitations) of what the classified world knows, and to deliver the OSINT in a form must helpful to the all-source analyst(s) integrating OSINT with classified. Responsible for assuring that OSINT product stands alone if it can. 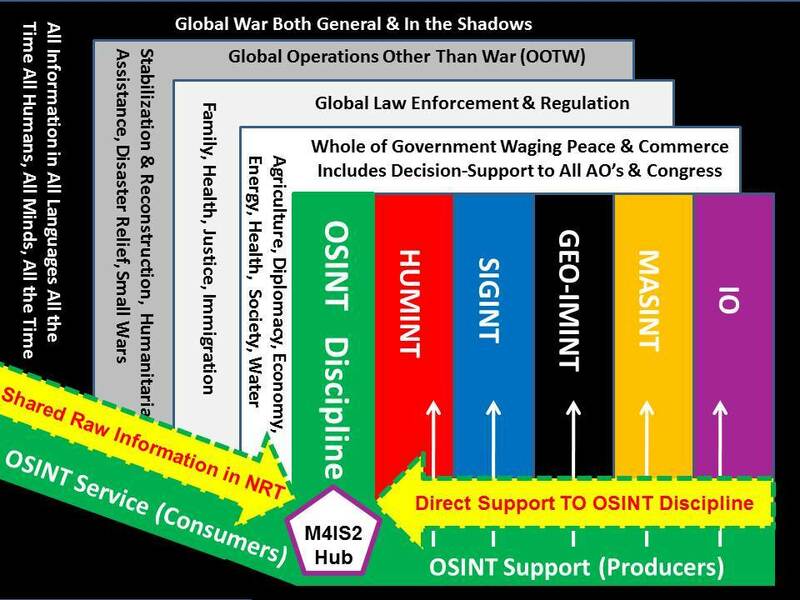 This is a quick look at where OSINT fits in relation to secret and existing staff feeds, we cannot under-estimate the impact on the decision-maker of random external influences, it is very important to have a solid grasp of what happens to your information after it is delivered, and to be constantly studying the decision-maker to see if they have been mis-guided by other sources of information including lies from allied services and leaders. 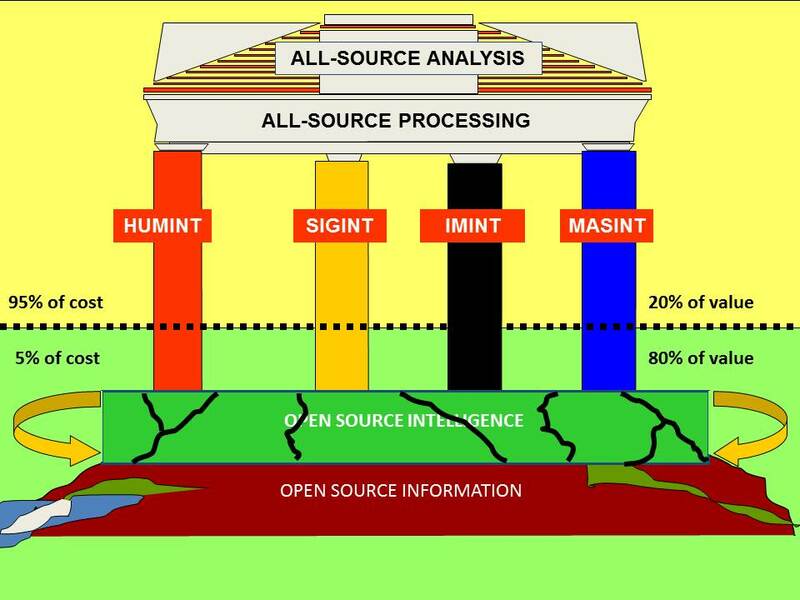 This is the original graphic from the 1980’s where I tried to explain that OSIF and OSINT are the foundation for the all-source temple. It makes no sense at all to send a spy where a school-boy can go. We must harness and harvest all of our human resources, and make the most of the least expensive, most open sources and methods. 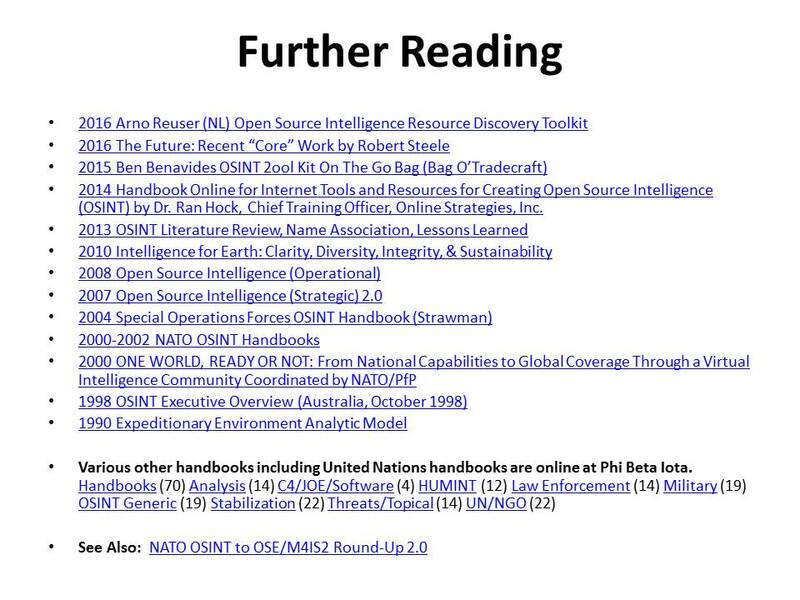 I wrote the NATO Open Source Intelligence Handbook in 2000. While good in its time the links are mostly broken and it should be re-done. 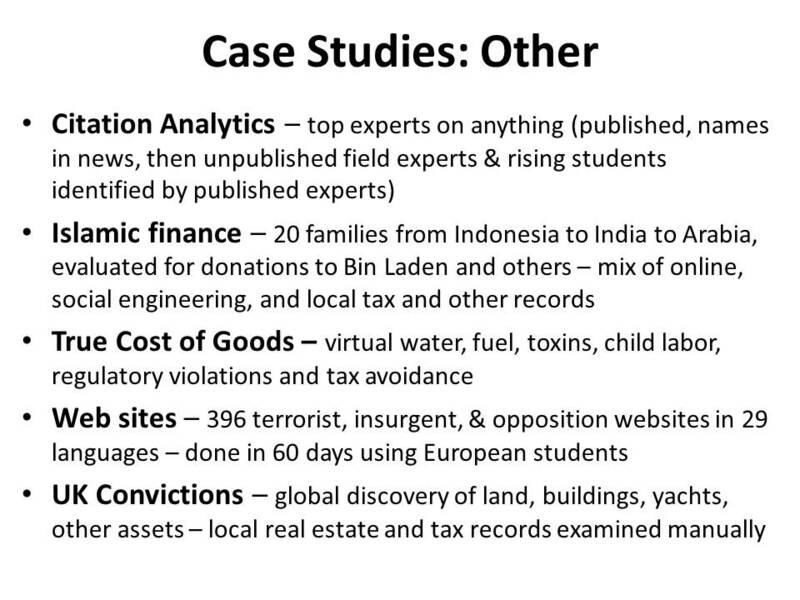 In my final slide I provide links to the best resources from a few top OSINT practitioners. 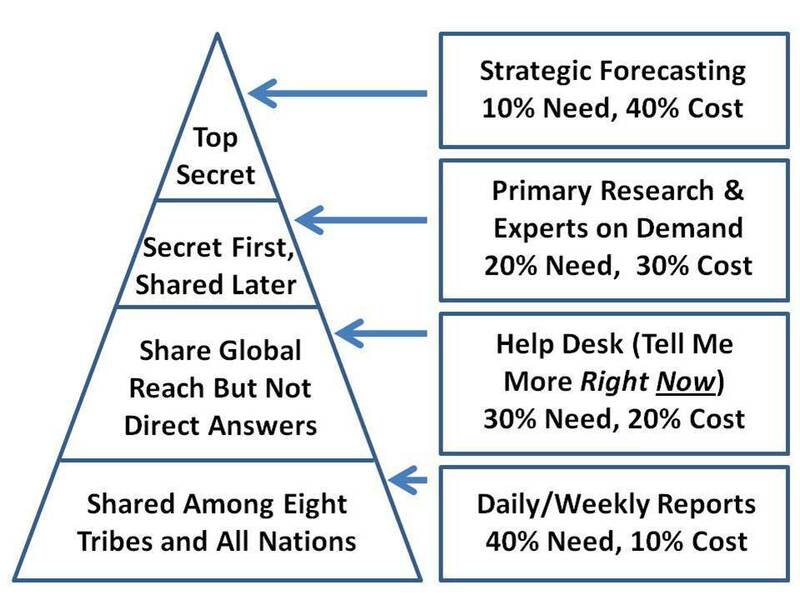 What is critical about this graphic is not the detail but the organization. OSINT includes sources, softwares, and services. I give all of them a failing grade for one reason or another, we can discuss this later. The major powers either don’t get it or lie a lot. You cannot achieve ground truth without a deep use of the local language. There are at least 31 core languages and over 136 others than need attention. 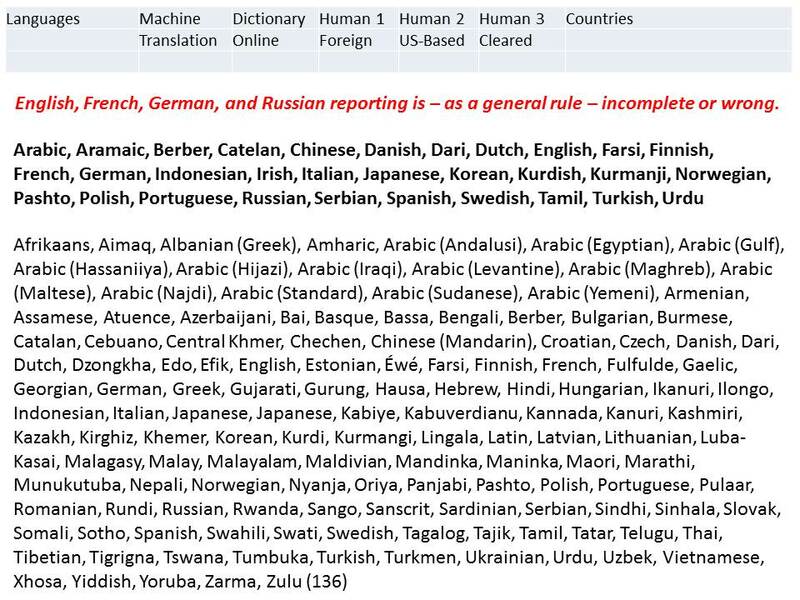 Machine translation is not good enough for most languages. You need a mix of indigenous speakers who also speak a Western language, and a handful of trusted officers who have spent a lifetime learning the target language. This is the heart of an OSINT cell’s advanced operations if you have more than six people. Note that it includes ingestion and sense-making processes, and that there are at least three outputs: human; written, and classified requirements. The Dutch service in theory is not allowed to use secret sources and methods unless the OSINT people certify they cannot find out using open sources and methods. 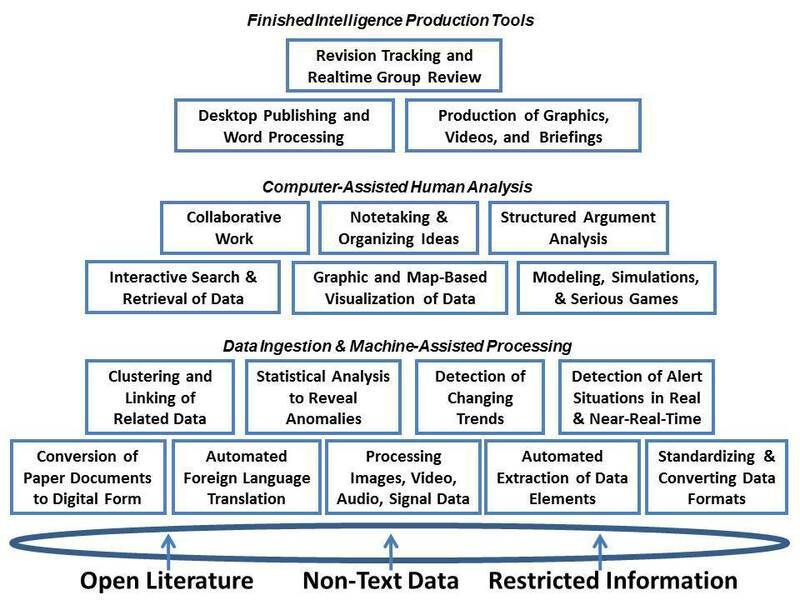 I was a founding member of the Advanced Information Processing and Analysis Steering Group in the 1980’s and into the 1990’s and I am sorry to say that despite our knowing then that we need all of this in an integrated tool-kit able to ingest and make sense of massive amounts of unstructured multi-lingual multi-media data, it still does not exist today. 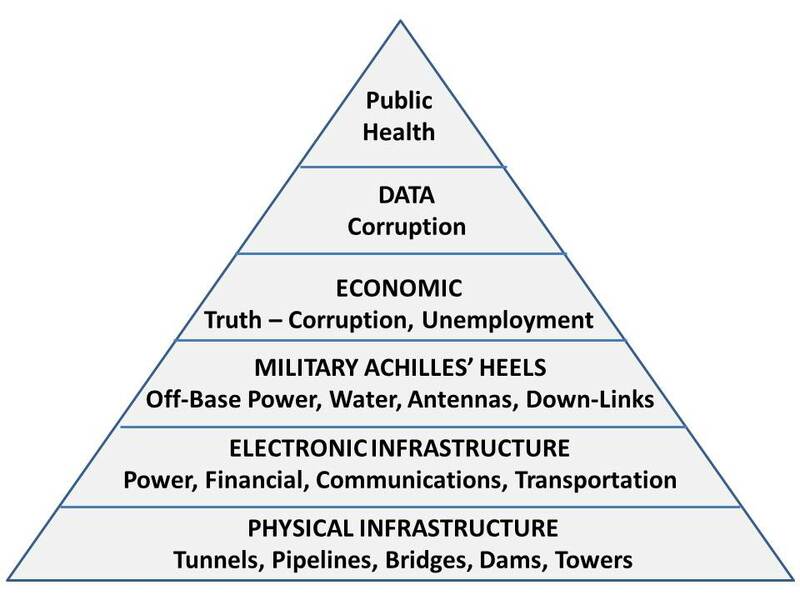 These are the eight areas where I would like to help just one country – all eight tribes of information – get it right. All of these eight quadrants are no better than yellow and most are red in my view. I cannot stress this enough. 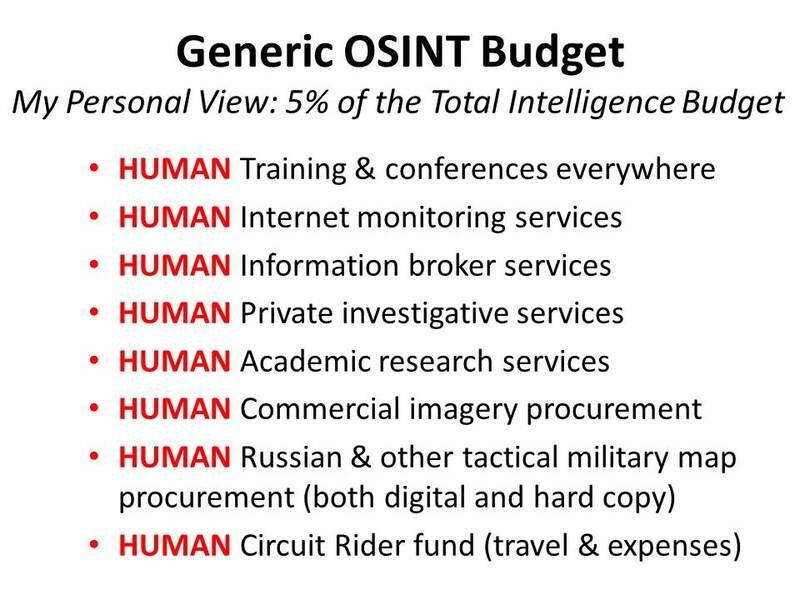 OSINT is HUMINT, not TECHINT, and OSINT requires adequate funding – on the order of 5% of the total intelligence budget – if it is to be fully effective. As a result, the Commission recommended that OSINT be a top priority for DCI attention and a top priority for funding. 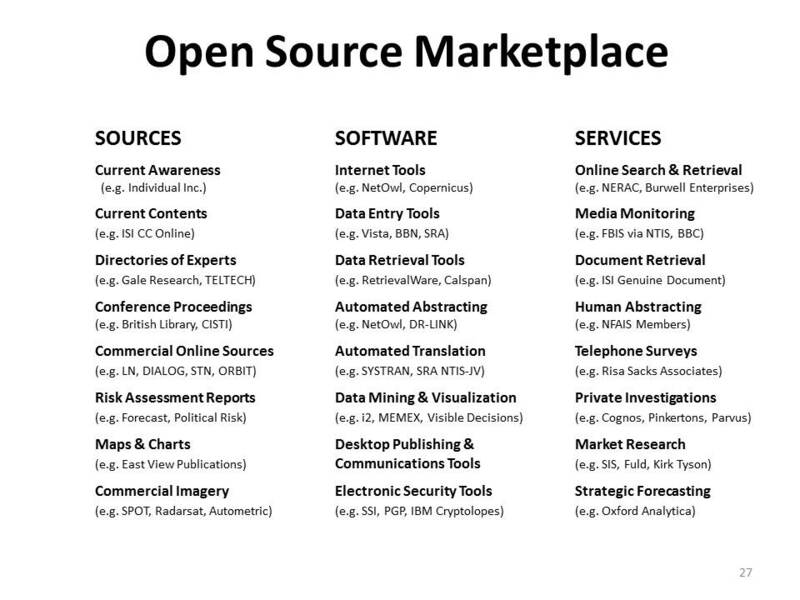 Later the 911 Commission recommended a separate Open Source Agency. Nothing happened. When I started the OSINT fight within the US Intelligence Community in 1988-1992, I noticed immediately that the civilians have no idea about the vital important of maps – and especially military charts with contour lines. 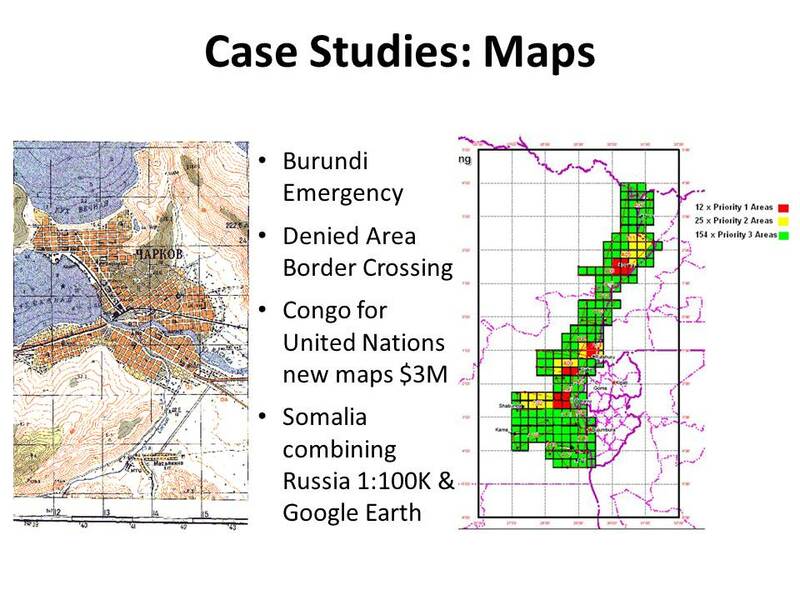 Over the years this has been one of the most important accomplishments in OSINT, greatly aided by the release of all the Soviet maps of Africa and South America – but not China, that warehouse mysteriously burned down – and by commercial imagery. With citation analytics for about $1,500 I can identify to most cited published experts, and from there get to unpublished field experts. I can also hire their best graduate students for 20 cents on the dollar. Finance and true costs require field work by humans, including examinations of hard copy tax and real estate and boat records. The best web monitoring is done in the original languages – students fluent in the target languages are inexpensive. This is what it looks like when it is working. No one has this. My own government refuses to be serious about OSINT or more recently, Open Source Everything Engineering, see http://tinyurl.com/Steele-Future for my full vision. In my view the Nordics should offer to host a joint EU-NATO Multinational Decision Support Centre and network whose primary mission will be to produce the truth and confront lies being told by others. I cannot over-state the importance of counter-intelligence. In the past 25 years what I have come to appreciate apart from the urgency of getting OSINT right, is counterintelligence. In the USA we have financial, ideological, and religious traitors in key leadership positions, and the FBI is not allowed to do its job. Rooting out traitors is fundamental. 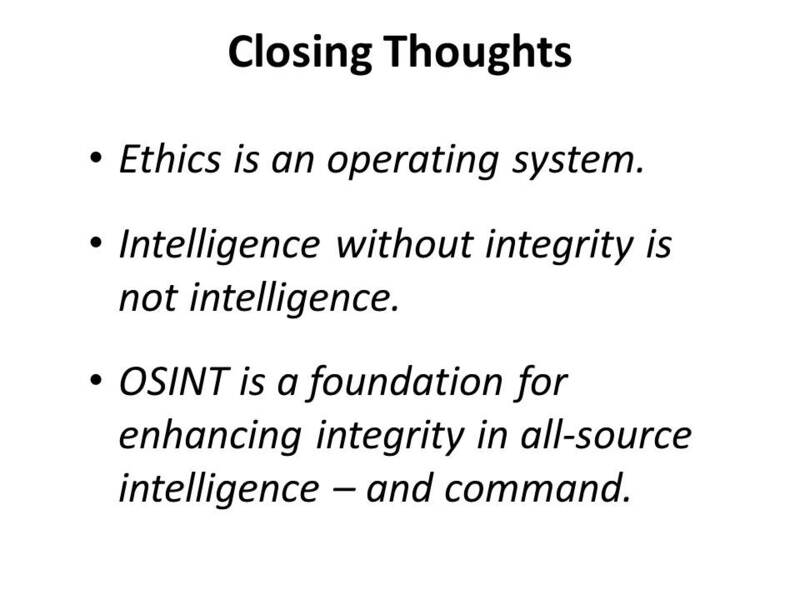 Ethics is an operating system. Will and Ariel Durant in Lessons of History speak to the role of morality in the game of nations. The US and Europe have failed to live up to their ideals – they actively support all but two of the dictators on the planet, and turn a blind eye to financial, religious, and ideological crimes against humanity. We in the intelligence profession have the power to educate, inform, and elevate. 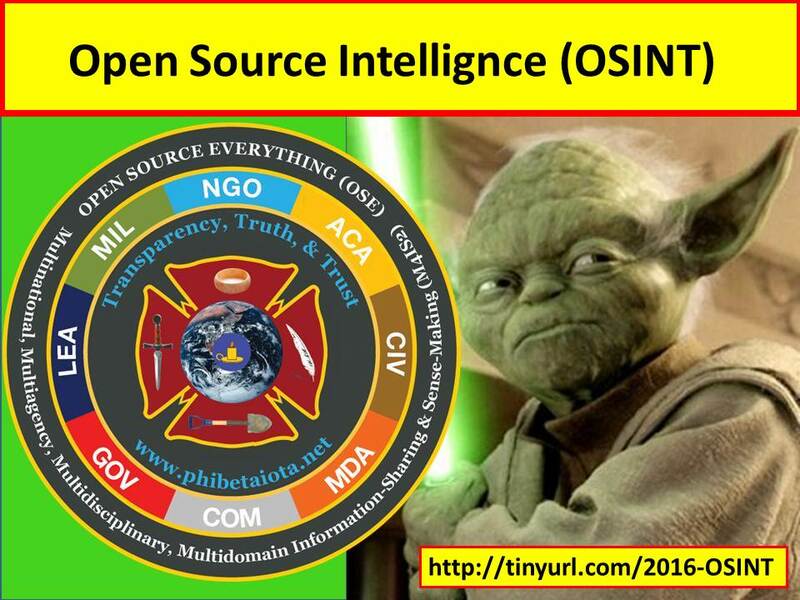 2014 Handbook Online for Internet Tools and Resources for Creating Open Source Intelligence (OSINT) by Dr. Ran Hock, Chief Training Officer, Online Strategies, Inc. Here are a few links, the larger website holds over 20,000 posts by over 800 contributors I have nurtured over the past 25 years and I am always available to support your learning as well as your work. If you did not note the tiny url before, here it is again. It is an honor to be in your company. NOTE: This is offered in very high definition that bogs down for many. Use Settings control (the “gear” symbol) to set at 360p in order to synch words and video. NOTE: Words in briefing as given are significantly different from pro forma words, but text below includes details on the OSINT Cell membes (6) and the information tribes (8) not included in the verbal briefing.